From eating, driving, and shopping. Not regular shopping, not Black Friday shopping either. If you read this blog you know it is not surprising we went to a moving sale on Friday, in Athens, where we were visiting. It was on frat row near the University of Georgia in a lovely Tudor house. The six of us descended on that moving sale like a family of vultures. We are awful. But not shopping at midnight awful. I bought two boxes of vintage items and my SIL, Sue, bought about the same amount of non vintage items. We are perfect thrifting partners as she buys newer items and I buy vintage. The 1940's heavy glass bookends, pictured above, were acquired weekend before last at a yard sale and were made by the Federal Glass Company. I am not keeping them and this table looks nothing like this today as we spent yesterday decorating the yellow house for Christmas and I changed my game plan for this table after the aforementioned moving sale. I will be taking photos this week and next of our finds from that moving sale and sharing those with Christmas posts. Linking with the darling Joy at Savvy City Farmer for Thrifting On A Thursday. we wish for you a joyous holiday. Now I have to run and clean my oven. A cake exploded (why I do not know) and it is not pretty. How many members of the Olive Out staff does it take to paint the lid of a jar? Not that there is a staff. Just Joe and me. I found the large jar at an estate sale. It had an ugly brown lid. It needed painting badly so I painted it badly. I changed the nozzle on the spray paint can, made a squillion drips and Joe had to rescue the lid with his pocket knife and heavily distress it. The ornaments seem to be old and I acquired them at an estate sale for nothing. I think I stole them. I did actually steal two lamps (we re-sell all these lamps) on Saturday from the nicest man. I drove away and realized that I had not paid him and when I returned to his sale he said he could not remember so just take them. I also painted a few Christmas items on Saturday that did not require Joe's assistance. Maybe there is hope for me. Linking: Marty at A Stroll Thru Life for Table Top Tuesday. 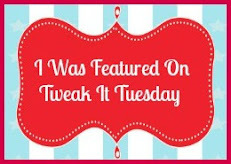 Linda at Coastal Charm for Nifty Thrifty Tuesday's. "The Civil War was really one of those watershed things. There was a huge chasm between the beginning and the end of the war. The nation had come face-to-face with a dreadful tragedy... And yet that's what made us a nation. Before the war, people had a theoretical notion of having a country, but when the war was over, on both sides they knew they had a country. They'd been there. They had walked its hills and tramped its roads... They knew the effort that they had expended and their dead friends had expended to preserve it. It did that. The war made their country an actuality." "What a war! Everything we are or will be goes right back to that period. It decided once and for all which way we were going, and we've gone"
From Fort Sumter to Appomattox the war is not forgotten here in the Deep South. It changed America and ended the heinous practice of slavery across the entire country . It also changed the economy from being based in agriculture to a more industrialized one. Joe and I live right in the path of General Sherman's "March to the Sea." We go to sleep to the sound of trains changing tracks almost every night at our old house. Those very tracks were pulled up, heated, and twisted into "bowties" by his troops in an effort to stop supplies getting to the Confederate troops. "We cannot change the hearts of the people of the South, but we can make war so terrible that they will realize the fact that however brave and gallant and devoted to their country still they are mortal and should exhaust all peaceful remedies before they fly to war." General Sherman stayed at the Brown House, in Sandersville, and used it as his headquarters while he was in the county. When he left, after two days, he had the courthouse and jail burned. The county was fortunate in many ways as he burned much in his path. One reason why we have no records on our old house is because we believe they were burned in this Civil War fire. Tremendous numbers of lives were lost in this war where brothers sometimes fought each other. Some five to six hundred thousand lives lost. Our cemeteries, in Georgia, are filled with Confederate graves like the first image above. Joe and I firmly believe history must be studied and learned so that it is not repeated. We are still students of history. "I can tell you who lost it — the South lost the war. But I'm not sure anybody won that war. It's a tragedy... On the face of it, the North won the war. But the bill for winning it was huge in human values, not to mention human lives. The plumbers toolbox is a favorite find for both of us. We have been calling it a plumbers toolbox anyway. Joe wants it for actual tools. No way is that happening lovey. I enjoy piling platters in it or books. I am beginning to think I need some sort of cloche intervention. I found this one Saturday and I really need to stop buying them. I found the large Williams Sonoma platter at one of the stores I consign for. Yet another cloche. I found three of the basket weave cloches at a yard sale for fifty cents each. You see why it is hard to stop? The one on the right is Italian. We found that vintage frame on the far wall at a local flea market. We are not having Thanksgiving at our house so the plumbers toolbox can stay here until the Christmas decor spills out happily. I will check back with you, my peeps, later today as I am going down to our town square to deliver some goods and shop a bit. 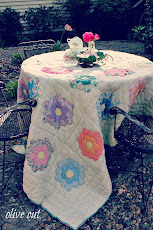 Linking with the delightful Debra of Common Ground for Vintage Inspiration Friday. I have been ironing vintage linens. It is not unusual to find single pillowcases. I do not fret about that. I pair them with another one in similar tones. These pillowcases are terribly soft and I have two or four on our bed at all times. I sell matching pairs when I find them. This little table scarf will be sold on consignment. It is in perfect condition. I soak all my vintage linens in OxyClean and hot water. Be patient when doing this, sometimes I soak them for twenty-four hours and change out the water and OxyClean. I use several scoops of Oxy depending on the amount of stain present. This does not damage embroidery or fine fibers like Clorox does. If I have a persistent stain I make a paste with OxyClean and put it directly on the stain. I already have a stain so what do I have to lose? This large rectangular table cloth was stained a lot. They are gone now but it does have some holes which is fine because that means I keep it. You can pick up stained vintage linens at tag sales, estate sales, and garage sales for a few dollars or less and turn them into beautiful accents for your bed or tables. If you have not tried the Oxyclean method I encourage you to do so and let me know how it worked for you. Linking with Sherry at No Minimalist Here for Open House Party. Do you buy furniture with no idea of where it's going? It is a glorious fall day here. I started off with a small fire in the wood stove and now I have the doors open. I have been dusting and moving Joe's chair around I showed you on Saturday. This room, despite it's windows, is dark so these photos are dark much to my dismay. A reader remarked that she liked the chair but it wasn't her colors. We have a faded cabbage rose sofa in green and pink in this very room. One day we want a neutral cream colored sofa. We paid all of twenty five dollars for each of the two sofas we have now. Spending more than that is going to be difficult. The chair does blend with our old crocks. The butter churn was my mother's and the lamp was Joe's mother's. We recently got the old pickle crock, beside the chair, at an estate sale. The unframed oil painting, on the left, reminds us of our trip to Italy. The art glass vase was a gift from one of my patients. Please ignore my terrible hair but I adore this image of Joe. I recently let my grey fly and will have some profile shots soon I hope. This is my view of the fall leaves as I type. I am still in a pickle as to where to put Joe's chair. Do you buy furniture with no idea of where it is going in your house? Linking with Marty at A Stroll Thru Life for Tabletop Tuesday. The crepe myrtles in our yard continue to show off and we have decided they have never looked this good before. I realize I am jumping from fall to Christmas but I have made a commitment, to myself, to post photos in real time as often as I can. So if you are dizzy from this I certainly am too. Take in beauty where you find it whenever you find it. He wanted it for a certain price. The lady who was holding the sale of antiques and vintage items, on her lawn, was trying to work with him. I had already bought an interesting pair of lamps from her the minute we got there. The fabric is soft and might be linen. It is more yellow in the background than it appears. When he decided to bundle the chair with this little round table they agreed on a lovely modest price. The lamps have pink pine cones on them. The lamp bases are marble. It is awful to photograph a large tall lamp. We had an enormous amount of fun going to estate and garage sales this weekend. I cannot begin to photograph everything we bought. One favorite item is a Rowenta iron for three dollars. I will spare you that image for sure. They are very expensive at around seventy dollars so I was delighted to find this one for ironing vintage linens which I buy and sell when I can part with them. Black, white, silver, and gold for Christmas. I did not plan that reflection in the mirror but am glad I captured it. This display was created by my friend, Bonnie, and I liked it so much I had to go home and grab my camera. This is the same store that had the beautiful red velvet sofa from Sunday's post. That table had contact paper on the top of it and when she pulled it off it revealed the black paint and she left it like that. 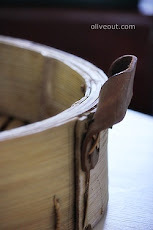 I am linking with Debra at Common Ground for Vintage Inspiration Friday. ...right outside our kitchen window. Wishing you a brilliant day. I am off to visit a neighbor, then have lunch with my sister. Joe's flea market finds this week are rusty and beautiful. Joe is going to use the toolbox for it's intended purpose but I could see it on a shelf in our den. It came full of tools too and I can barely lift it. The rusty things with hooks are scales and we have no idea what purpose the long handled tool has. He paid about twenty dollars for all of this including the toolbox. Joe is in his element when he finds tools to buy. I will be visiting you, my peeps, later tonight, because I traveled yesterday to Greenville, S.C. to have new tires put on my Mini and I am exhausted. Thank God I was in the Pottery Barn, in the mall, when the dealership called me about an additional issue and gave me the price. If you are going to nearly swoon a Pottery Barn sofa is the place to do it. 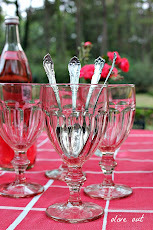 Linking: Linda at Coastal Charm for Nifty Thrifty Tuesday. Kim at Savvy Southern Style for Wow Us Wednesday's. A nine foot tall live Christmas tree and a red love seat sets the scene for one of our local consignment stores near our old house. The love seat sold as I was snapping these images so I am glad I took them even though the sun was in my eyes. I consign a few items here (that Holidays book is one of mine) and enjoy the ladies who manage this store. I helped them a wee tiny bit to get ready for their ribbon cutting ceremony with the chamber of commerce. Joe and I are thrilled that our small southern town now has several businesses on the square. I consign at three of them and have a ball doing it. Joe is also a big help in this endeavour and by now you know we are all about the thrill of the hunt. In my next post I will show a silver, black, and gold vignette, from this store, that is terribly pretty. It made me turn around and get in my car and fetch my camera. I am linking to The Tablescaper, for the very first time, for Seasonal Sundays.